Hello it’s Jan the ‘wanabe’ quilter again. 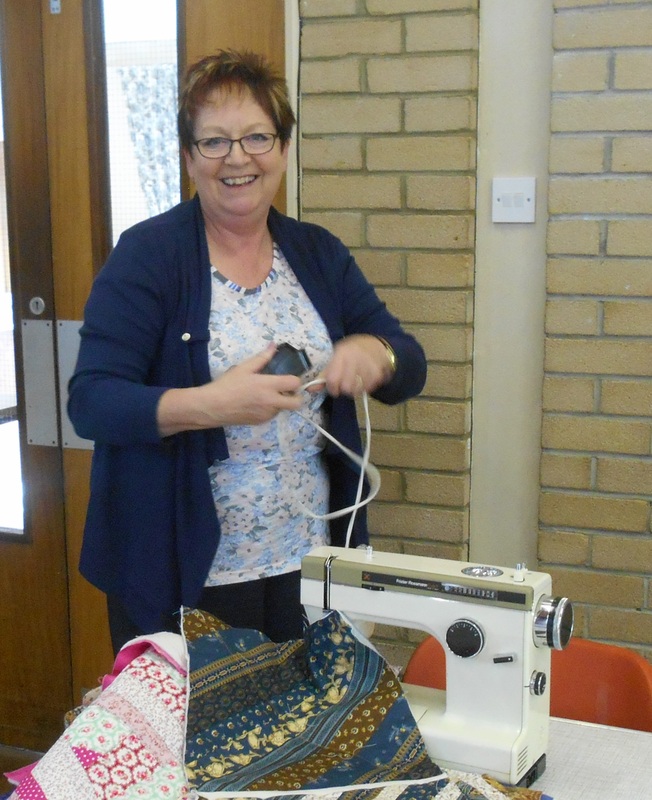 I thought you might like an update on our SAS Sewing Group. Well since the last time I posted I am delighted to say I have finished a quilt! Yes, FINISHED a quilt. Well when I say ‘I’ I really mean WE. Although we are all working on individual projects we share a common goal, that is to make quilts for the Quilts For Comfort Charity, and this quilt would NEVER have been made if it wasn’t for the brilliant team of the SAS to support me. Joking aside, If it wasn’t for my friends encouraging me and sharing their expertise and knowledge I would have given up at the first hurdle. Thanks girls. Now back to the QUILT which I am calling Miracle! It started out as simple ‘stitch and flip’ blocks which June, a member of both Usworth Quilters and The Quilters Cupboard, showed me how to make from scraps of material. Thanks number one team member. Another of my friends from the SAS team, called Anne was also making this block, imagine our surprise when we compared blocks and lo and behold we were both using the same colour scraps of material. Enter number two team member! Anne enjoys hand sewing so all hers were made by hand while mine had been machined. Between us we made 12 blocks which we then needed to join together. In stepped Joan a marvellous quilter from the Usworth Quilting Group and an integral part of the SAS team. Joan showed us how to trim the blocks down to the same size, then make them into a quilt using the ‘Quilt as you go’ method. Enter number three team member! Followed swiftly by numbers four and five in the shape of Heather and Jan (also from the Usworth Quilting Group)who had many tips for accurate matching of seams, placement of pins and endless words of encouragement. I machined the ¼ inch seams (not very accurately at times) and Anne hand stiched the back sashes very neatly. In order to ralley on to the end we were served endless tea and coffee each week, Cheers Margaret, number six team member. Then Voila one finished Miracle! Needless to say Anne and I are very proud of this first attempt and would like to thank the SAS team for all the tutorials, support, advice, encouragement, tea, coffee, biscuits, friendship and laughter which went into the making of the Miracle Quilt. PPS, Although this is mine and Anne’s first quilt it is not the first quilt completed by the SAS team, please enjoy the photos of other quilts the team have completed. Here we have Betty (seated) who loves to hand sew; she made this simple quilt held up by Margaret (left) and Pamela (right) from mixed squares, all neatly sewn together with love and care. Ann here is a St. Andrews church member and likes nothing better than joining quilt blocks which have been donated to make into quilts, look at this one. With the help and advice of our SAS team of experts, (thanks girls, you know who you are) Ann completed this beautiful quilt. Proving teamwork is fundamental to our ability to bring comfort through our group. Categories: Quilts for Comfort | Permalink.